Walter Galli was born in Massachusetts on January 4, 1913. 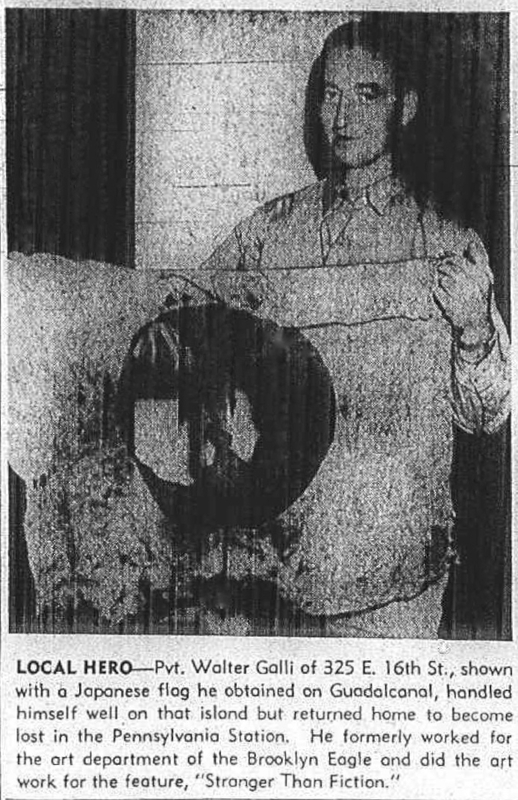 His birthplace was recorded in the 1940 U.S. Federal Census, and birth date was found at Find a Grave. Galli has not yet been found in the 1920 and 1930 censuses. The Brooklyn Daily Eagle published his Stranger Than Fiction panel, which was written by Richard W. Thomas, beginning April 1, 1935 and ending June 5, 1937, according to American Newspaper Comics (2012). That panel was followed by Galli’s But It’s True which ran from May 11, 1937 to July 4, 1940. Galli also produced material for a handful of comic book publishers. According to Who’s Who of American Comic Books 1928–1999, his career began in the 1930s with his Stranger Than Fiction, which that work says was published by the Centaur Comics Group. In the 1940 census, Galli and his mother, Sophia, resided in Brooklyn at 217 Bainbridge Street. He was a commercial artist who had completed two years of high school. During World War II he enlisted in the army on April 7, 1942. He was stationed in the Pacific Theater and saw combat at Guadalcanal. After his discharge, he married Dorothy Roubicek, in early 1944. She left the editor position at All-American Comics near the end of February, according to Julius Schwartz in All-Star Companion, Volume 1 (2004). Their marriage ended in divorce. She is best known as Dorothy Woolfolk. Galli was listed in the Manhattan City Directory at 110 West 40th Street, for the years 1946, 1948 and 1949. In 1959 he was at 31 West 11th Street. In the 1950s and 1960s, Galli illustrated several books including Mountains in the Sea: Japan’s Crowded Islands (1957), Skyscraper Island: How Ships Built New York (1957) and Light in the Dark Forest (1961). 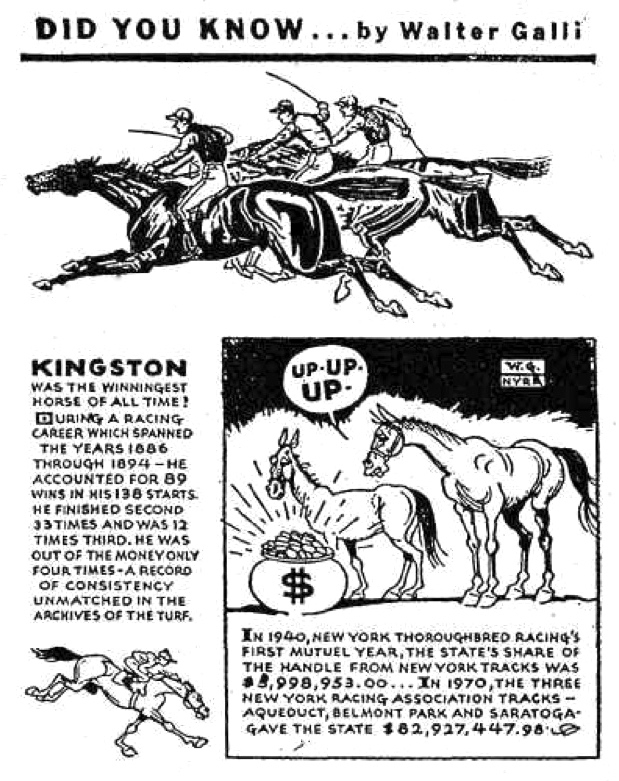 In the early 1970s he drew the panel, Did You Know, which was about race horses. 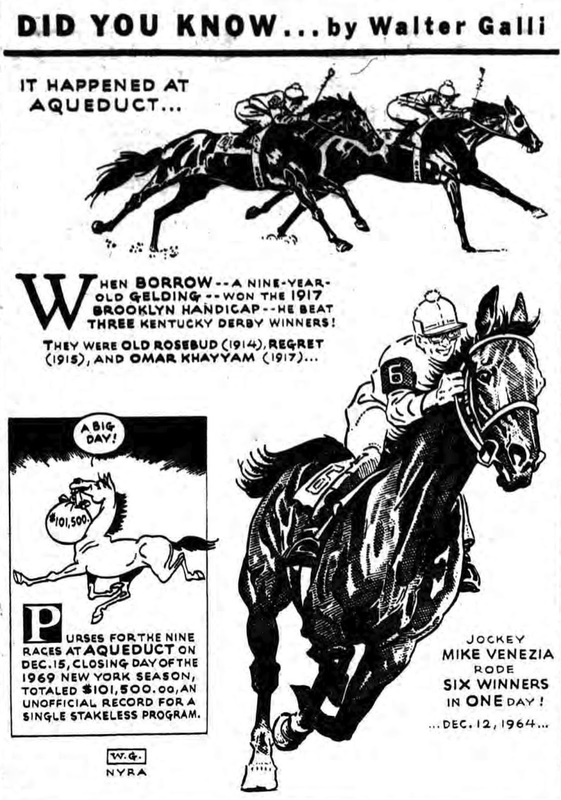 It was sponsored by the New York Racing Association (NYRA). Galli passed away April 25, 1974, in New York.